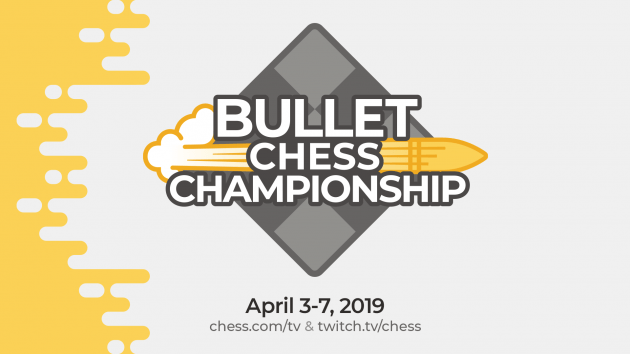 The Bullet Chess Championship will run from April 3-7, and will be broadcast live on www.Twitch.tv/Chess. The total prize pool is $15,000. Below you will find a breakdown of the rules, prizes, confirmed players and the complete schedule. Hikaru Nakamura — Chess.com #1 Bullet player at time of invitation. Maxime Vachier-Lagrave — World #2 blitz (FIDE) at time of invitation. Alexander Grischuk — Three-time world blitz champion. Levon Aronian — World #4 blitz (FIDE) at time of invitation. Sergey Karjakin — World #4 blitz (FIDE) at time of invitation. Alireza Firouzja — Chess.com #1 Bullet player at time of qualification. Federico Perez Ponsa — Chess.com #12 Bullet player at time of qualification. Olexandr Bortnyk — Chess.com #4 Bullet player at time of qualification. Alireza Firouzja won the first qualifier on April 3 and claimed the eighth seed in the knockout. Federico Perez Ponsa won the second qualifier on April 4 and received the seventh seed in the knockout. Olexandr Bortnyk won the round-robin qualifier on April 5th and receives the sixth seed in the knockout. Hikaru Nakmura and Olexandr Bortnyk each defeated their halves of the bracket on April 6 to reach the Bullet Chess Championship finals. Hikaru Nakamura defeated Oleksandr Bortnyk in straight sets to win the first Bullet Chess Championship on April 7. Matchups and pairings are based on FIDE standard ratings as of March, 2019. April 6, 10 a.m. PT: Championship bracket (8 players) quarterfinals and semifinals. If a qualifying spot is won by someone on the second day qualifier event whom already qualified for the Quarterfinals or Round-Robin Qualifier, then the seat will go to the next person in line in terms of Chess.com tiebreaks. If two players are tied with the same total score, they will play two-game sudden death matches until one player scores 1.5/2. These mini matches will start after a brief (5 minute break) following the conclusion of the main Round-Robin portion. Draws count as 0 points toward the total score in that "Set"